Rubble and jagged strips of metal lay amongst the ruins of the once great Packard Automotive Plant in Detroit. 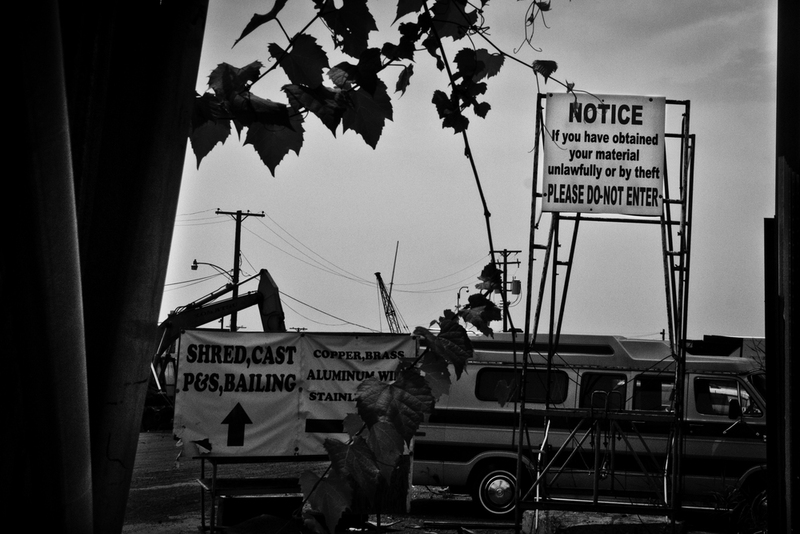 The plant is now a popular site for scrappers. A local scrapper heads out from his warehouse in search of metal. Scrapyards across Detroit and the surrounding areas have been forced to crackdown on those who attempt to sell metal illegally scrapped. A scrapper lifts heavy metal out of an abandoned elevator shaft at the Packard Plant, Detroit. A makeshift road cuts through the Packard Plant of Detroit. Many of the abandoned plants are completely blocked off. Scrappers breakdown walls and clear rubble to provide routes for their vehicles. A mobile torch and tank sit outside an entrance to the Packard Plant while a scrapper searches inside for valuable metal. A local scrapper cuts the metal frame of a bay door at the Packard Plant, Detroit. 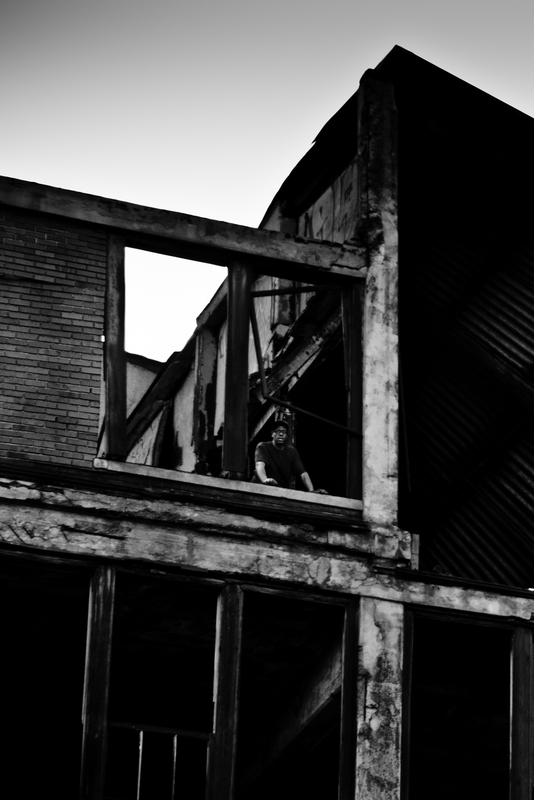 An abandoned warehouse lies gutted, a clear sign that scrappers have been here before. An employee cuts through metal beams at H&H Metals, Detroit. Purchased metal of all types stacked into piles before it is sorted, recycled, and then exported. Many scrapyards deal primarily with industry scrap metal in order to avoid the legal issues surrounding individual scrappers. H&H Metals, Detroit. Signs decorate the loading scales to ensure those scrapping metal understand the strict policies. H&H Metals, Detroit. A man selling scrapped metal waits for payment as a receptionist views his file. 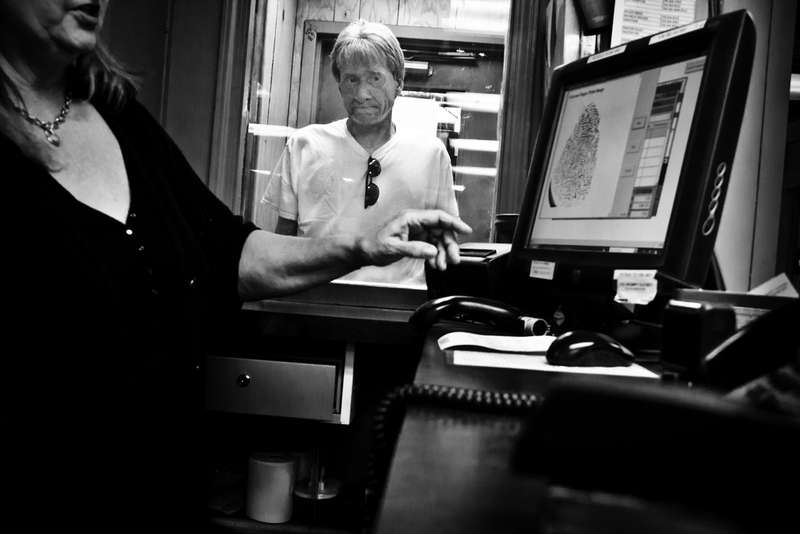 The strict Michigan laws require metal yards to have photo identification, social security number, address, and a recorded fingerprint of all customers. H&H Metals, Detroit. Security cameras blanket the facility, another method to ensure the legality of the business. H&H Metals, Detroit. Local Ronny "Packard" poses for a photo and shows scars from gunshots he claims he received after a confrontation with a man scrapping for metal at the Packard Plant. 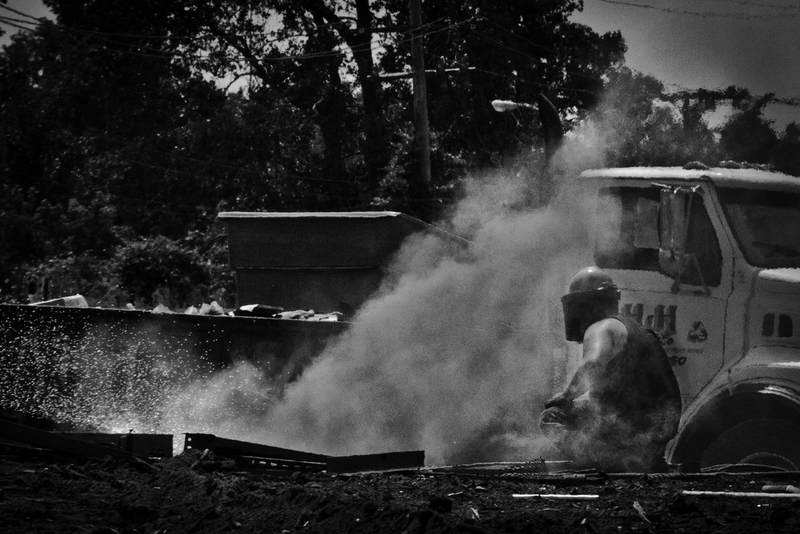 Ronny is one of many who feel metal scrappers destroy property and cause problems for the city. Packard Plant, Detroit. 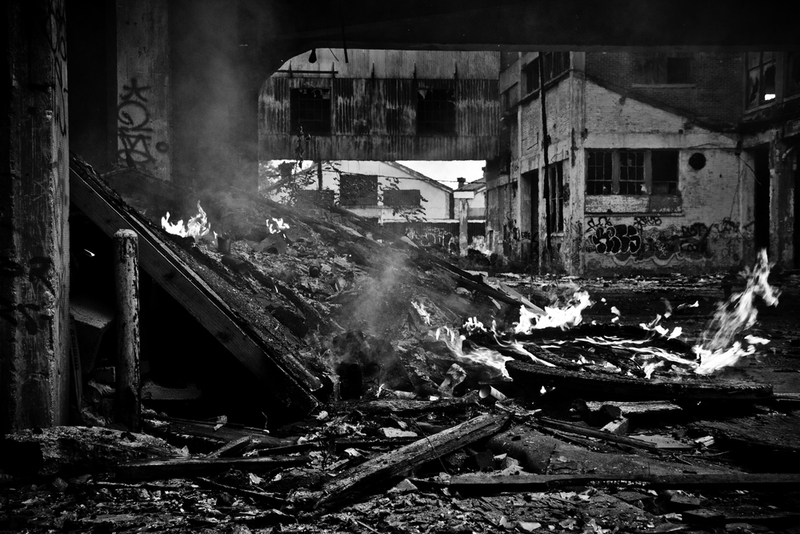 Fires litter the streets and abandoned structures of Detroit. Many are the result of scrappers who utilize them to melt the coatings on the metal they obtain. Packard Plant, Detroit. A man keeps watch for police and traffic as his partner scraps metal above. 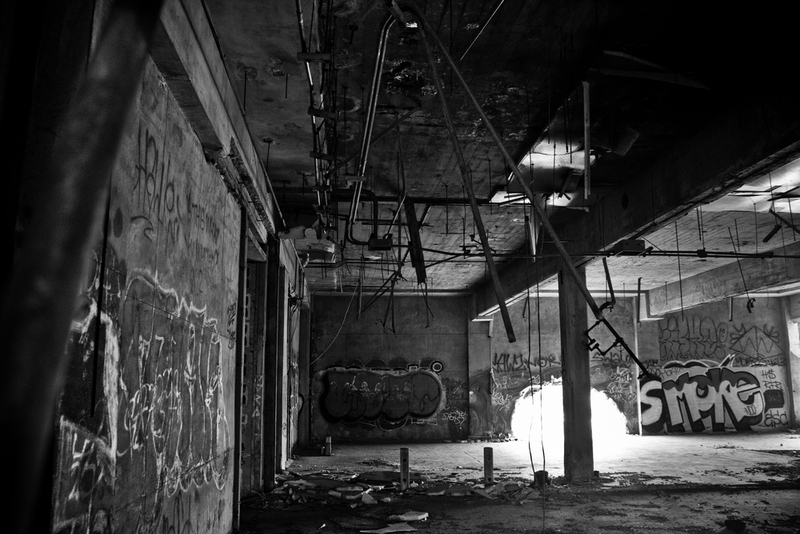 Packard Plant, Detroit. A scrapper looks down from the fifth floor of the Packard Plant to speak to his partner. Packard Plant, Detroit. Two scrappers work together to retrieve valuable metal from the Packard Plant. After the metal is cut from the building it is thrown from five stories down to the street where the second man retrieves it. Packard Plant, Detroit. A guard dog protects the entrance of a metal scrappers warehouse. Detroit. A man looks over his warehouse amassed with a clutter of objects. Many of the items were illegally scrapped and stored to be sold for profit. Detroit. 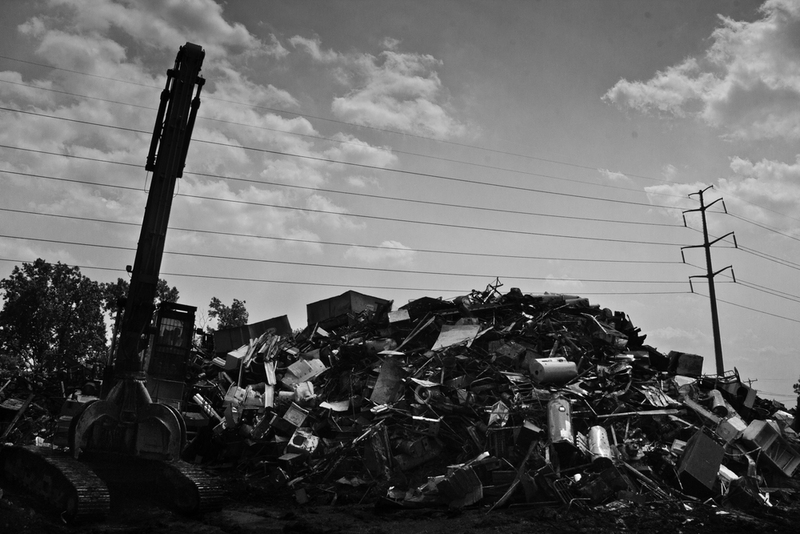 A scrapped vessel sits on top of a massive pile of unsorted metals. H&H Metals, Detroit. 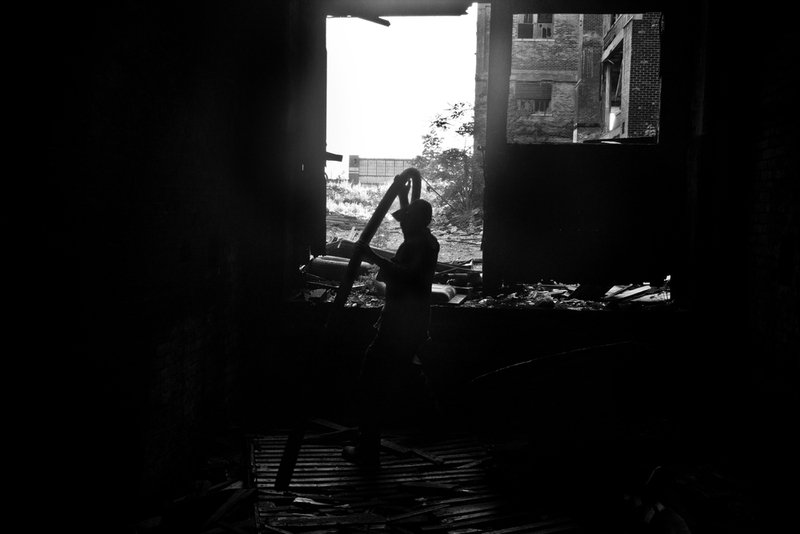 A scrapper wanders through the Packard Plant in hopes of finding what little metal may be left in the infrastructure. Packard Plant, Detroit.